In the blogaround, Shaker Rehmeyer dropped the link to a post at Kotaku, in which is republished a poster advertising a contest in which "Electronic Arts is asking Comic-Con goers to 'sin to win' a dinner and 'sinful night with two hot girls, a limo service, paparazzi and a chest full of booty.' To enter the contest, conventioneers need to 'commit acts of lust' by taking photos with the models working the Dante's Inferno booth or any other booth babes at the show. Those photos then need to be uploaded to Twitter, Facebook or emailed to Electronic Arts." 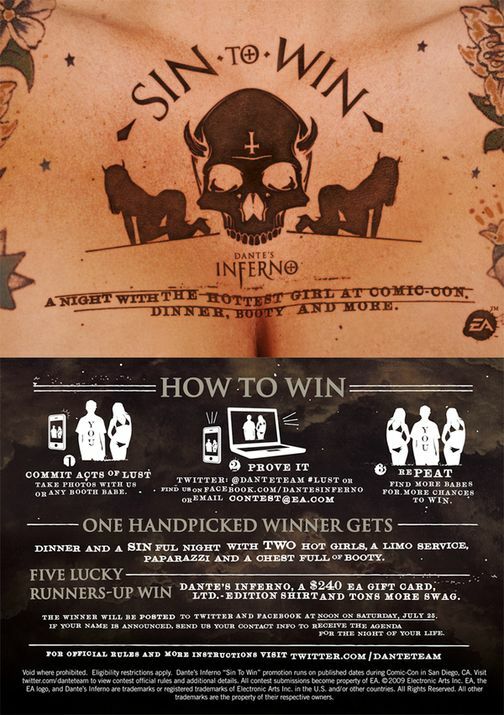 In case you can't view the image, or in case it escaped your notice, the background of the top half of the poster is a woman's chest and cleavage, with "Sin to Win," a skull, and the silhouettes of two women on their knees emblazoned across the skin as if a tattoo. Shaker Knitmeapony points to additional coverage at The Escapist, and Shaker Scott points to Ars Technica. Shaker Anna also emailed the link to Ars Technica with the note: "I'm honestly not sure where to start. It's bad enough that they are using mostly-naked women to sell video games—but to encourage outright predatory behavior and then reward it with a 'sinful night' with 'two hot babes' just makes my brain bluescreen. Even the ad has naked women posing around a presumably 'geeky' guy in a baggy t-shirt. It's just /sick/." I don't know what else I can add to that.